The archbishop of Crete, Irenaios, has written to all of the island’s priests telling them not to ask worshippers to make donations to the Church in return for carrying out a baptism, or marriage and funeral services. It is common for holy men to request cash on such occasions but Irenaios suggested that, given the current economic crisis, the Church should think carefully about its behavior. 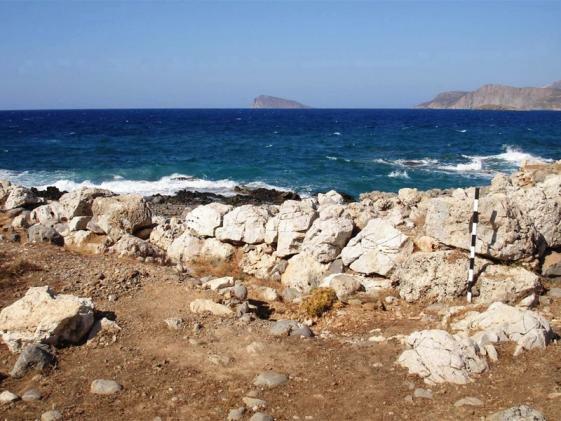 A team of archaeologists have discovered a fortification system at the Minoan town of Gournia, a discovery which rebukes the popular myth that the Minoans were a peaceful society with no need for defensive structures. The team’s efforts were led by Professor Vance Watrous and Matt Buell of the University at Buffalo. Located on the north coast, Gournia was in use during the neo-palatial period (ca. 1700-1450 BC), when Minoan civilization was at its height. The town sits atop a low ridge with four promontories on its coastline. Two of these promontories end in high vertical cliffs that give the town a defensive advantage, and it is here that the fortification system was discovered. The team weren’t able to excavate the area, and so relied on photography, drawing and surveying to identify the fortifications. The eastern-most promontory had a heavy wall that was about 27 meters long. Beside it the team found a semi-circular platform of stone, almost nine meters in diameter, which they believe is the remains of a tower or bastion. The other fortified promontory had a two meter thick wall, running east-west, “as if to close off access from the sea,” said Buell. The town consists of around 60 tightly-packed houses, a ship shed, and a small palace in the centre, and archaeologists have discovered evidence of wine making, bronze-working and stone-working at the site. “Gournia gives you, the visitor, a real feeling of what an Aegean town was actually like. Walking up the streets, past the houses, you feel like you’ve been transported into the past,” said Buell. In addition to the beach fortifications, it also appears that the Minoans built a second line of defence further inland. Heading back from the beach, there were two walls, together running about 180 meters east to west. Backed by a tower, or bastion, the walls would have posed a formidable challenge to any invader trying to march into the town. Defenders manning this system of fortification would have rained projectiles down on attackers, by using bows and slings. The walls had stone foundations and were made of mud brick, making them sturdy enough to stand on. It’s an open question as to whether the people guarding the fortifications were part of a militia or something more organized. There was “definitely a body of men who would have had that duty but we don’t know exactly what they were like,” said Professor Watrous. Tombs uncovered by Hawes and other excavators have shown people buried with swords. Watrous said that there was one particular tomb that produced an entire collection of daggers, swords and other items. However, Gournia’s fortifications did not prevent the town’s demise. The town fell around 1450 BC, along with other Minoan settlements. A new group called the Mycenaean appeared on Crete at this time, taking over the island. Watrous said that Mycenaeans probably avoided attacking the town by sea. “Many other settlements were destroyed at the same time. My guess is that they just came along the land; they didn’t have to come up from the sea”. He cannot say for sure if the town defences were ever actually put to their intended use. Any evidence of a battle near these fortifications, such as weapons or bodies, would be underground, and excavation would have to be carried out to see if they exist. One thing that excavators can say is that the people of Gournia had something worth fighting for. Many of the goods they made – such as the wine and the bronze implements – were for export, suggesting that the people had some level of wealth. THE bestselling author Victoria Hislop has rejected an offer of about £300,000 from Hollywood to turn her debut novel about a leper colony off Crete into a blockbuster film. Keen to preserve the integrity of the book and to give something back to the Mediterranean island on which it is based, Hislop has instead allowed one of Greece’s main television channels to dramatise her story for a fraction of the fee. Since its publication in 2005, The Island has sold more than 1m copies in Britain alone, won several awards and been translated into more than a dozen languages, including Greek. The popularity of the novel in America led to Hislop, 50, being courted by several film studios. “Some were offering me high six-figure dollar sums for the rights,” said Hislop, whose follow-up novel, The Return, set in Spain, has also been a success. After spurning Hollywood, the author settled for “far less” from Mega, the Greek broadcaster, which is turning The Island into a 26-part drama that has just started filming. “I really don’t mind,” said Hislop. “What I wanted, and will now get, is a chance to have a say in the TV series. “Of course it is the writer’s script, but I feel much happier with some of my input and knowing that the Greeks, who took the book to their heart, will care about making the series and keep loyally to the plot. Hislop is no doubt mindful of the fate of Captain Corelli’s Mandolin by Louis de Bernieres, a wartime novel set on the Greek island of Cephalonia, which was filmed in 2001 by John Madden, the British director. In the hands of Universal, the US studio, Nicolas Cage and Penelope Cruz were considered miscast as a captain in the Italian army and his Greek girlfriend. The Island tells the tale of Alexis Fielding, who goes in search of her Greek mother’s past, uncovering tragedy and passion. The TV adaptation will employ about 300 local actors and is expected to cost £3.5m — despite the country’s economic meltdown. She also said the deal did not preclude secondary rights being sold to a British film or TV company at a later date.